Snow Peak Hozuki LED Lantern. Re-stylized with a sleek new profile, Snow Peak improved the innovative LED Candle Mode, interplaying with the wind or sound in your environment, creating a realistic flicker of ‘candle’ light. 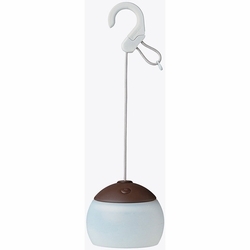 A new added feature is the Intelligent energy-saving Sleep Mode, which turns off when your space becomes silent, conserving power in the new rechargeable battery.The versatile hanging hook doubles as a light stand, and can be used at your desk or campsite table. The Hozuki is now available in three serene color options.